The Tablet's Student Zone free teaching resources are designed to support the teaching and learning in ethics and the philosophy of religion. They are designed for students aged 16-19. Based on Tablet articles from the archive, each resource includes a set of comprehension questions to test students' understanding of text and topic, a number of longer-answer questions and activities designed to direct students' further research and develop written skills and two broader activities, designed to encourage and shape group discussion. All these resources and all the articles referred to in them are free and may be copied for students as necessary; students will need access to the internet in order to complete some of the questions and activities. The resources aim to stretch and extend students: not all the questions and activities are easy and teachers are encouraged to review the resources and specify tasks suitable for the particular group and/or individual students. They are best used as part of a varied scheme of work and adapted as part of teachers' planning process. The resources may, however, be appropriate to copy and use with students 'as a whole' when a teacher is absent for a number of days, to extend bright student(s) or to provide work for a student who is not in lessons for some reason. • skills in the analysis and evaluation of arguments. The resources assume general knowledge of the topic in question, which could be gained through reading the relevant sections of this website and/or following up links to other recommended sites, or by studying the topic in class. Some resources may be useful to support the teaching of the topics as part of non-examined courses in RE, RaVE, citizenship, general studies, theory of knowledge or similar. Teaching Religious Studies is not easy. Not only does the subject rely on a huge body of specialist knowledge from topics as diverse as philosophy, psychology, sociology and textual criticism; it also requires a particular set of teaching skills to support young people as they engage with material and questions that are not just academic but also intensely personal and socially sensitive. In May 2011 an RS teacher received "appalling injuries" in London when beaten by the relatives of a girl in his class who took exception to her being taught about other religions. Given this, it is ironic that so many teachers are expected to teach the subject without much formal training and it is testament to the dedication of teachers that the subject is so popular and taught so well around the world. 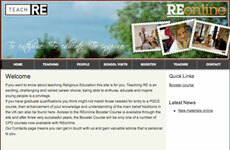 If you would like more information about teaching RS have a look at the following websites. Teach RE is based in England and maintained by the Association of Church College Trusts, providing information and materials to those interested in teaching RE including a booster course for non-specialists converting to RE teaching, and PGCEs and other professional qualifications in the UK. The Australian Catholic University and Charles Sturt University are market-leaders in offering graduate qualifications for teachers of RaVE in Australia. The website of the Times Educational Supplement with its RS-related pages is not only the best site for recruiting RE teachers and finding jobs, in the UK and abroad, but it provides many free resources and an archive of news and information relevant to teaching. Useful government documents from the UK include the non-statutory national framework for religious education, a book of materials used to teach about world religions in schools in England and some additional 2010 guidelines. The non-statutory framework for RS was developed in 2004 to encapsulate the UK's non-confessional and academic approach to teaching RS, which has been held up as a model to the rest of the world through documents such as the Toledo Guiding Principles of the Organisation for Security and Co-operation in Europe (OSCE). The latest non-statutory guidance explains how this should be being implemented in England and Wales. In addition, the Department for Education audit of materials used to teach world religions gives useful guidance on methodology as well as reviews of resources. There are, of course, many other areas of study which cannot be covered here. Some of the topics above appear as part of other subjects as well. For example, students may cover ethics as part of critical thinking, theory of knowledge, global perspectives or values education courses; specific topics such as environmental ethics may appear in geography or economics courses. AS and A2 courses for 16-19 year old students are offered by the examination boards AQA, EdExcel, OCR, WJEC and CCEA. Each board offers one specification in Religious Studies, which is distinctive to that board in style and in the options for the content to be studied (though all boards share an agreed assessment framework and standards). The specifications and sample assessment materials may be found here for AQA, here for EdExcel, here for OCR, here for WJEC and here for CCEA. GCSE courses for 16 year olds are offered by the same boards, though there are several specifications offered by each board to cater for different religious denominations and interests. Courses in RS are also offered as part of the International Baccalaureate Diploma and Cambridge International Examinations' Pre-U Diploma, though these are (as yet) far less popular than A-level. The popularity of GCSE, AS and A2 examinations in Religious Studies has grown exponentially in the past decade. Numbers taking A2 RS in England have risen 31.2 per cent since 2005, reaching 18,463 entries in 2011. Numbers taking AS RS reached 33,915 and numbers taking GCSE RS reached 221,974 in the same year. In England and Wales the introduction of the new English Baccalaureate may see a decline in the numbers taking Religious Studies at GCSE and A-level from 2011. Despite a campaign to persuade Education Secretary Michael Gove to include RS as an examined subject in the EBacc, he refused to alter his model which requires students to study either History or Geography to age 16 and will measure school performance in terms of student grades in these subjects alone. Comments from the department seemed to suggest that RS as an examined subject should be classed as an easy or "soft" subject and that sufficient attention would be paid to the subject area through non-examined compulsory RE classes required under the terms of the 1988 Education Act. RS is the fourth most poular subject in N Ireland at GCSE, with over 6 per cent of all subject entries or 11,770 of the 183,899 grades awarded in 2010 being in the subject. In Scotland RS is known as RE in Catholic Schools, RME in other state schools up to age 16 and RMPS when taught as an examined subject post-16. The Scottish Higher course in Religious, Moral and Philosophical Studies is offered by SQA and the specification can be found here. The numbers studying RMPS have increased significantly recently. According the TES "only 2,323 pupils sat RMPS in 2006; this year there may be 4,100 candidates". A Scottish Standard course in is also offered by SQA and the specification can be found here. The new Scottish Curriculum for Excellence sees RME as a core part of the curriculum and its introduction should herald a positive period of growth for the subject north of the border; the rationale for the "Philosophication" of RE in Scotland is discussed here. The State Examinations Commission offers Ordinary and Higher Level options for the Leaving Certificate in Religious Education. A sample Ordinary Level paper may be found here. A sample Higher Level paper may be found here. The new Australian Curriculum includes three cross-curricular priorities: appreciating the contribution of Aboriginal peoples, engaging with Asia, globalisation and sustainability, and values education and/or ethics. In recent years both Federal and State governments have become more interested in values education; ethics courses have even made an appearance in state schools as an alternative to time spent with chaplains. This has been rather controversial in New South Wales, where a member of the state government accused such courses of being a malign influence in teaching the ideas of ethical thinkers other than Jesus Christ. Federally funded chaplains work in schools, offering pastoral support and teaching something about their own religious tradition, but they are usually untrained either in theology or teaching, so the instruction tends to be rather basic and confessional. In Queensland the activity of chaplains has been challenged in the courts in recent years by those who see it as contrary to the principle, established in Australian law back in the nineteenth century, that education should be secular, compulsory and free. Independent schools, many of which are affiliated to Churches, set their own schemes of work and assessments for Religious Education. State boards of education typically offer 'Studies of Religion' as an option for the Higher School Certificate (or the equivalent in other states), largely to cater for students in Independent Schools who wish for an academic qualification in Religious Studies to recognise the work they have done over the years. The HSC specification offered by the New South Wales Board of Education, which is typical, may be found here. State schools may include something about religion as part of other cultures as part of the SOSE curriculum or similar and non-denominational Independent Schools may teach about religion in 'global perspectives' courses. Independent schools set their own schemes of work and assessments for Religious Education. The NZQA offers national standards at levels 1, 2 and 3 in Religious Studies for the National Certificate of Educational Achievement which can be found here. Within Catholic Schools there is a common framework that may be adopted to structure teaching across the age-range which may be found (along with various New-Zealand selected resources) here. Ethics and religions is one option within the personal, social and humanities learning area' of the new secondary school curriculum. The course requires students to study normative ethics and applied issues such as human rights, medical ethics (abortion, euthanasia, bioethics), capital punishment, sexual ethics, environmental ethics, business and economic ethics and media ethics. It then offers them a choice of religions to study. The history and teachings of this religion and how it affects believers in serving the community and forming worship-practices are then examined through written papers and projects. The specification and other support-materials may be found here. Courses in RS are also offered by faith schools and, to a lesser extent, by international schools. IB world schools may teach ethics as part of the theory of knowledge course.